Medlars are the fruit of the Mesilipus shrub/tree. 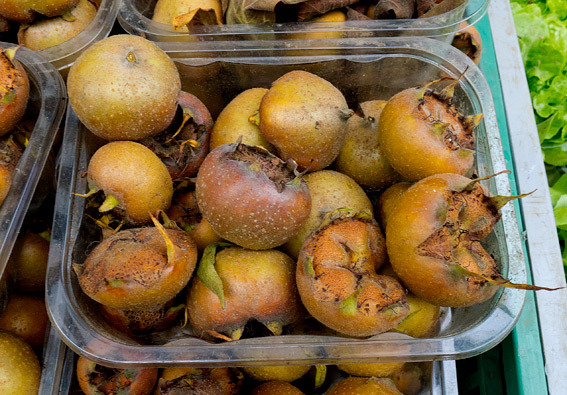 The plants are common to Europe and Asia Minor and whilst they’ve fallen out of favour lately, Medlars were once popular enough to warrant a mention in Shakespeare’s Romeo and Juliet. The fruit itself looks a bit like a cross between a Crab Apple and a Rose Hip. Unsurprisingly, the plant comes from the rose family and is a relative of apples, pears and quinces. Because of it’s unusual shape the old fashioned, vulgar, name for the fruit is “open arse” and in French “cul de chien”! I first noticed Medlars in Neal’s Yard Dairy, a couple of weeks ago and as per the cheese, Neal’s Yard were kind enough to offer a tasting. Interestingly, the fruit has to decompose before it’s good to eat – a process called bletting. The fruit is either left on the tree until the first frost (around the end of October or beginning of November), or it’s picked and stored in a cool dry place. Once bletted, the fruit looks a medium brown colour (inside), not unlike that of an over ripe or bruised apple which is going off. Medlars taste very sweet and creamy (slightly similar to apple purée). 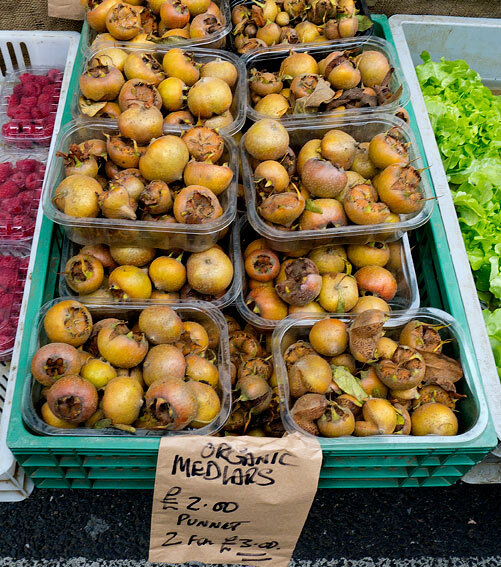 Having never noticed the Medlar before, I came across them again at Islington Farmers Market (on the Chegworth Valley stall) this and last weekend. Evidently they are making a comeback! Medlars are often used to make jelly, cheese and creams. Nigel Slater recommends roasting them with pheasant, which is also in season now. This entry was posted in Food, Recipes, Shopping and tagged apple, cheese, crab apple, Islington Farmers Market, jelly, medlar, Neal's Yard Dairy, pheasant, quince, rose hip. Bookmark the permalink. Brilliant post and I didn´t know about the others names 😉 Am back on the trail of medlars now…fingers crossed! v nice, when can you come round to cook with me ? I’ve never seen them at the Islington Farmers Market before, though I wouldn’t be at all surprised if they’ve always had them at Borough Market.